Many Android devices are equipped with at least one camera. There are a number of ways to allow the user to record video from within an Android application via these built-in cameras, but by far the easiest approach is to make use of a camera intent included with the Android operating system. This allows an application to invoke the standard Android video recording interface. When the user has finished recording, the intent will return to the application, passing through a reference to the media file containing the recorded video. As will be demonstrated in this chapter, this approach allows video recording capabilities to be added to applications with just a few lines of code. Before attempting to access the camera on an Android device, it is essential that defensive code be implemented to verify the presence of camera hardware. This is of particular importance since not all Android devices include a camera. The presence of a camera facing away from the device screen can be similarly verified using the PackageManager.FEATURE_CAMERA﻿ constant. A test for whether a device has any camera can be performed by referencing PackageManager.FEATURE_CAMERA_ANY﻿. When invoked in this way, the intent will place the recorded video into a file using a default location and file name. The above code example simply displays a toast message indicating the success of the recording intent session. In the event of a successful recording, the path to the stored video file is displayed. When executed, the video capture intent (Figure 74-1) will launch and provide the user the opportunity to record ﻿video. As with video capture, the intent may be passed the location and file name into which the image is to be stored, or left to use the default location and naming convention. In the remainder of this chapter, a very simple application will be created to demonstrate the use of the video capture intent. The application will consist of a single button which will launch the video capture intent. Once video has been recorded and the video capture intent dismissed, the application will simply display the path to the video file as a Toast message. The VideoPlayer application created in the previous chapter may then be modified to play back the recorded video. Create a new project in Android Studio, entering CameraApp into the Application name field and ebookfrenzy.com as the Company Domain setting before clicking on the Next button. On the form factors screen, enable the Phone and Tablet option and set the minimum SDK setting to API 26: Android 8.0 (Oreo). Continue through the remaining screens, requesting the creation of an Empty Activity named CameraAppActivity with a layout file named activity_camera_app. Navigate to app -> res -> layout and double-click on the activity_camera_app.xml layout file to load it into the Layout Editor tool. Remaining within the Attributes tool window, change the ID to recordButton. Before attempting to launch the video capture intent, the application first needs to verify that the device on which it is running actually has a camera. For the purposes of this example, we will simply make use of the previously outlined hasCamera() method, this time checking for any camera type. In the event that a camera is not present, the Record Video button will be disabled. 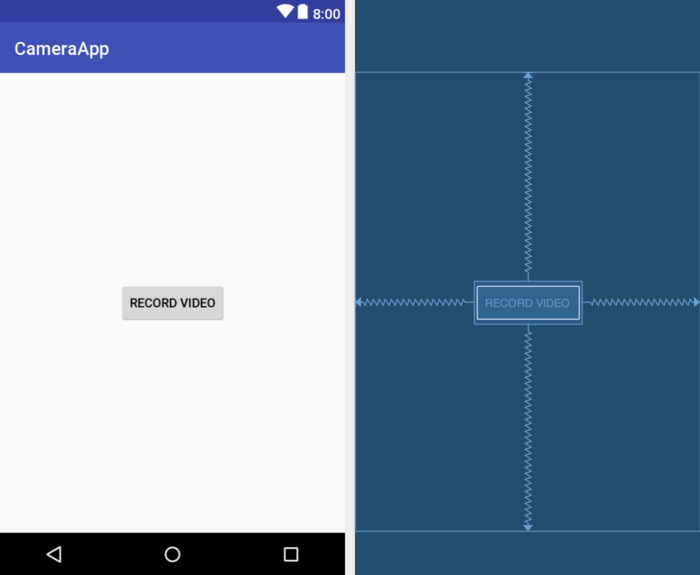 Compile and run the application on a physical Android device or emulator session, touch the record button and use the video capture intent to record some video. Once completed, stop the video recording. Play back the recording by selecting the play button on the screen. Finally, touch the Done (sometimes represented by a check mark) button on the screen to return to the CameraApp application. On returning, a Toast message should appear stating that the video has been stored in a specific location on the device (the exact location will differ from one device type to another) from where it can be moved, stored or played back depending on the requirements of the app. Most Android tablet and smartphone devices include a camera that can be accessed by applications. While there are a number of different approaches to adding camera support to applications, the Android video and image capture intents provide a simple and easy solution to capturing video and images.